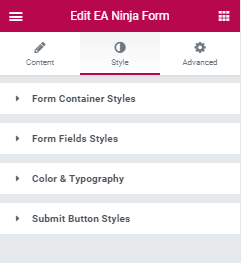 You can design any form that you have created with Ninja Forms with EA Ninja Forms element. This documentation assumes that you already have Ninja Forms installed on your WordPress website. The starting point for the customization process can be as random as you want it to be. From this option, you only need to pick the form that you want to add styling to. Use the drop-down menu to do so. From the Style options, you can add styling to your form. You will see sub-options bundle placed under four accordions. Form Container Style- From here you can adjust the padding, margin, max width, background color of the container of your form. click on the pencil icon at the very bottom to open the Box Shadow customization options. 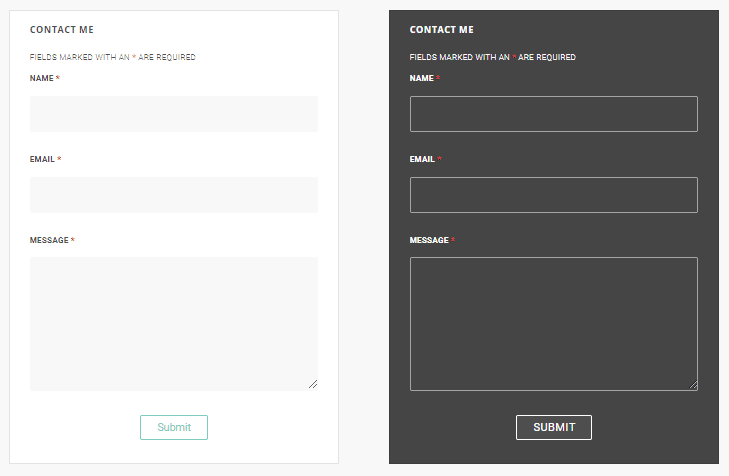 Form Fields Style-You can pick an input field background color that complements the background color of the container. Furthermore, you can adjust the alignment, width, margin, padding, and radius of the form fields as a whole. Similar to the Form Container Style bundle, you will see a pencil icon at the very bottom of the panel. Click on it to open the customizer pop-up. Color and Typography- You can pick a common font color for the labels of your form fields. Additionally, you can also specify which color the typed in text into the fields will be. Then you can edit the Label and Input field typography separately. Submit button Style-First adjust the button alignment and width. Afterwards edit the typography, margin, and padding for the button text. You can adjust the Text & Background color, Border radius of the normal and hover background of the button. See how beautiful Ninja Forms stylings you can build with Essential Addons. Click to see Live Demo.